The Great Famine or the Great Hunger is the name given to the famine in Ireland between 1845 and 1849. The Famine was partly due to "the (potato) Blight" that almost instantly destroyed the primary food source for many Irish. The blight explains crop failure; but the famine had other factors, including economic, political, social and religious. 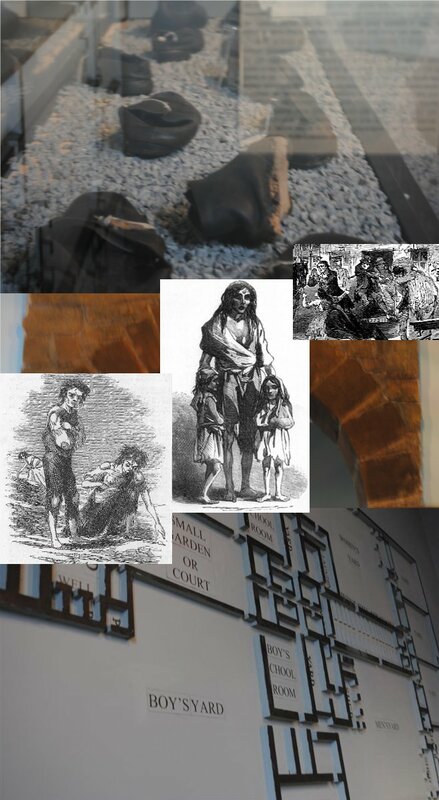 In the Famine Gallery, you will find authentic shoes from a famine grave, a famine pot from Bailieborough Workhouse as well as contemporary images of the famine and its disastrous consequences. There is also a reconstruction of a decrepit famine cottage and of the dreaded workhouse. Government policy: the government felt that it was not their job to feed the masses, and that it was up to the Irish to sort out this problem themselves, an attitude known as 'laissez-faire'. Instead, the welfare of the Irish was to be left to private charity, with landlords taking care of their own tenants. Some landlords were charitable but most fondly remembered are the Soup-Kitchens of the Society of Friends (Quakers). Unlike other denominations, they did not require a conversion from Catholicism before offering help, a phenomenon known as `souperism'. As conditions rapidly deteriorated in 1847, one Soup-Kitchen in Bailieboro was feeding up to 16,000 people daily. Landlords were not always quite so charitable; some whose tenants were unable to pay their rents were themselves facing bankruptcy, others took the opportunity of their tenants' misfortune to clear their estates by mass eviction. Between 1845 and 1853, landlords in Ireland evicted 87,123 starving families because they could not afford to pay their rents. Cecil Woodham-Smith, an authority on the Irish Famine, wrote in The Great Hunger; Ireland 1845-1849 that, "...no issue has provoked so much anger or so embittered relations between the two countries (England and Ireland) as the indisputable fact that huge quantities of food were exported from Ireland to England throughout the period when the people of Ireland were dying of starvation." Almost throughout the five-year famine, Ireland remained a net exporter of food. Christine Kinealy, a University of Liverpool fellow and author of two texts on the Irish Famine: This Great Calamity and A Death-Dealing Famine, writes that Irish exports of calves, livestock (except pigs), bacon and ham actually increased during the famine. The food was shipped under guard from the most famine-stricken parts of Ireland. But the poor had no money to buy food and the government then did not ban the exports.